Youtube’s app on Android recently bagged a major update, bumping it into version 13 as opposed to the former 12.x versions. 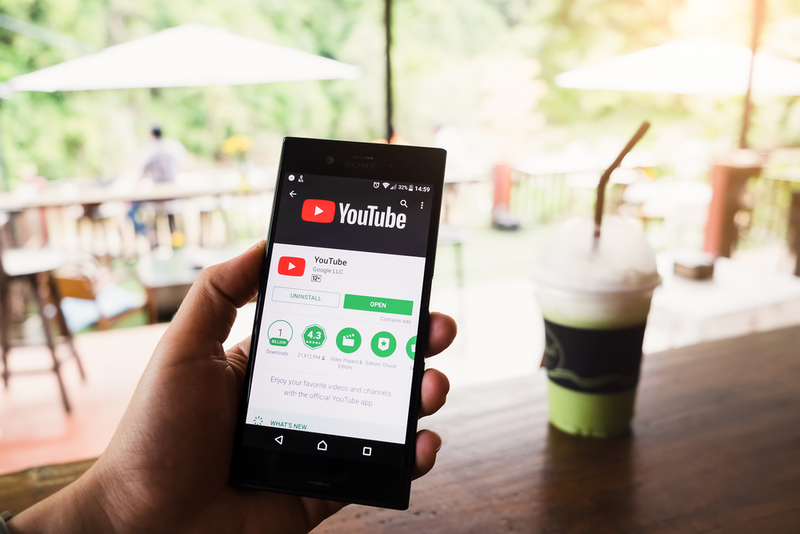 You may notice any significant changes in YouTube’s app on Android right off the bat, it holds several clues for upcoming features hidden within its code. The app just got a teardown treatment, which revealed headlining features such as a dark theme, incognito mode, and an improved ad-skipping experience are in the works. YouTube added a ‘dark theme’ to its web platform back in early 2017. We’ve been waiting for the company to port this much-loved feature over to its apps for the longest time. This latest teardown shows that the company has made progress from the very first sighting of the dark theme on mobile. It’s now implementing dark mode throughout the app and may provide us with an option to make the switch away from the current light theme really soon. Recently, Google has been trying to lay more emphasis on the privacy of their users, who feel the tech giant access to a lot of their data. To curb this, Google has added “Incognito Mode” to Chrome and Gboard but it seems like YouTube might be the next app to get this privacy-focused feature. The well-known Chrome Incognito icon was found buried in the code of the new YouTube app update, so it looks like the company is finally planning to simplify its privacy controls. The Incognito switch would be the equivalent of pausing watch and search history. Advertisements are the prominent source of revenue for both YouTube and its creators, so they’ll always be there before monetized videos. You can get a $9.99/month YouTube Red subscription or an ad-blocker app to get rid of them. 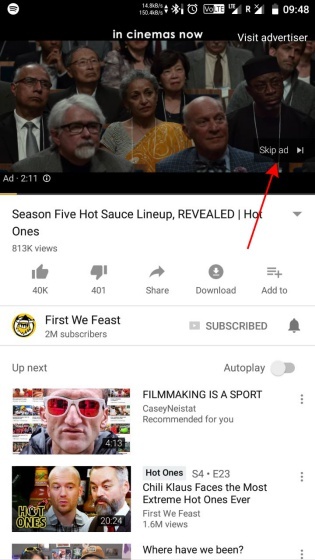 If not, then you will have to sit through five seconds of an ad and then move past it using the ‘Skip Ad’ button to watch the video. This is a dead user experience and a lot of people hate it. 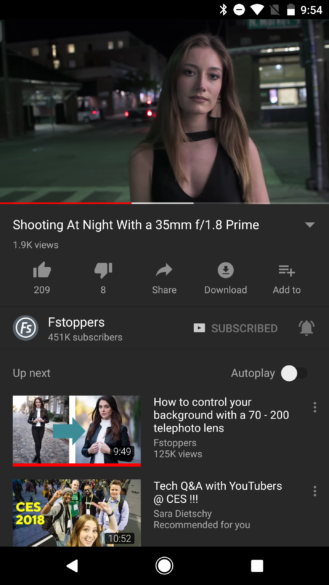 So, it seems like YouTube is experimenting with a gesture-based interaction, where it becomes possible for you to swipe on the screen to skip the ad. In addition, YouTube has introduced a minor change to the “Autoplay” setting, which has been shifted from under the General menu to its very own settings menu. This feature, if you’re unaware enables you to automatically play the next recommended video. There is currently no info on this change but it’s highly possible that YouTube might be planning a more prominent role for autoplay in the future. The YouTube app is already well-designed but the aforementioned updates will be like the cherry on top and I’m eagerly waiting for them to go live later this very year. Are you also excited about the dark theme and incognito mode? Let us know in the comments below.